Sinsheim - New 1899 Hoffenheim striker Anthony Modeste is not one for hanging around, “I’m not happy with people telling me maybe, or that they don’t know - I’m comfortable taking decisions myself”. The 25-year-old striker has had a somewhat peripatetic career from Nice to Hoffenheim, via Bordeaux, Blackburn and Bastia, but wherever he has been, he has scored goals - 14 of them last season to help Bastia to a mid-table finish. He hopes, however, to have finally found a home in Hoffenheim and the Bundesliga, citing that the German top division “is suited to my style of play”. 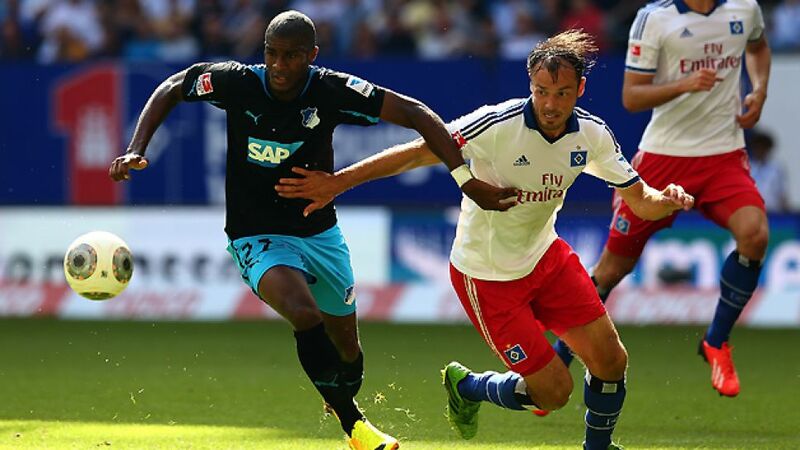 Could Modeste have made a better start to life in blue? Probably not. Five goals in his first three competitive appearances have fired his new club to the top five in the league, heady heights that were not reached at all last season. And the striker who models himself on Didier Drogba has set no goals for himself either, except to “score as often as possible”. It may be just a whisper with only two games played following last season’s brush with relegation, but the side’s current incarnation under Markus Gisdol, spearheaded by Modeste, is bringing back memories of the free-flowing football which propelled them to the mantle of ‘Herbstmeister’ or Autumn Champions in the 2008/09 season. That side was also led by a striker with a French past in Vedad Ibisevic (now of VfB Stuttgart). Ibisevic scored 18 times in the 17 games that comprised the first half of that season, a campaign that tailed off after his injury, with Hoffenheim finished in 7th, a more than respectable position for a side in their first-ever Bundesliga outing. The start, fired by Ibisevic’s goals had promised so much more, though, and many still believe that had he the Bosnian stayed fit, TSG could have challenged for the title. This time the title is perhaps a step too far, but in Modeste, Hoffenheim have reason to be optimistic about improving on last season's inadequate 16th place finish. The goals this season have fired those expectations, and all have borne the hallmark of a quality centre-forward capable of impressing in the Bundesliga: a swivel-volley against 1. FC Nürnberg on the opening day followed by an angled near-post volley and poacher's tap-in against Hamburger SV. The Frenchman is quick to credit his “understanding and harmony” with his team-mates, particularly the mercurial Roberto Firmino. All football fans are aware however, that pretty attacking triangles often come to nothing without a ruthlessly clinical striker, and Hoffenheim feel they’ve found their man, a man whose performances are making those excitable whispers harking back to a halcyon era ring louder every passing week.